I had a school friend who's family would regularly head to Center Parcs for weekend breaks. I was always envious of the stories about cycling through the woods, whizzing down water slides and gliding through the rapids. Don't get me wrong - I had a wonderful childhood and we went on plenty of holidays but I felt like I was missing out on the magic of Center Parcs. So earlier this year when my parents offered to take us - along with my brother, his girlfriend and their baby - to Longleat for a long weekend, I (at 25) obviously didn't hesitate to say YES PLEASE!! Upon arriving, I was mildly disappointed we had to park up in the car park until 3pm - when the barrier opens and the race is on to locate your cabin. However I soon began to appreciate the 'no parking' policy within the grounds - you can drive to your cabin to unload, but then all cars must be left at the car park until your day of departure. This means everyone travels by one of three ways - foot, bike or the land train (similar to those little trains you get at the beach in the summer). We did discover that it is totally worth taking a food shop with you (or picking one up on the way). The onsite supermarket was a little pricey and heading out to the local Morrisons meant we had to rejoin the queue to get back in. Lesson learnt! After settling in and filling the cupboards, we didn't waste any time and cycled straight up to the 'Plaza' and spent an hour or so exploring the pools, slides and rapids. I think over the whole weekend the rapids were my favourite thing to do! We had been advised to book in a few activities before we went, so signed up for miniature golf on Saturday, an afternoon in the Aqua Sana (spa) for the girls on Sunday and bowling on monday. The golf was pretty fun and we played two different courses. 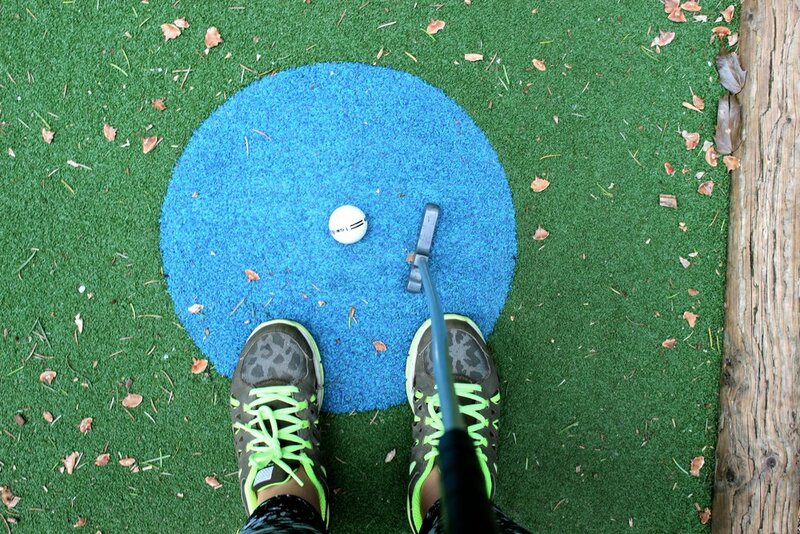 I find the less you try with miniature golf the better you tend to be! My Mum was an absolute whizz! Saturday afternoon took us to the Jardin des Sports where we played tennis. I used to be quite good as a child...or so I thought. The Venus Williams in me seemed to be recovering from Rio that weekend - my tennis was utter crap. I left the boys to it and spent some time watching my nephew with Mum. One of the best things about the weekend was spending time with Oscar. Even at just 3 months old it's incredible how quickly he is changing, and you notice small differences every day. I feel truly blessed to be Aunt to such a beautiful baby boy. Sunday morning was spent in the trees. Literally. Me and Dan booked the 'Aerial Adventure' session - a series of high ropes and obstacles set in the trees just next to the lake. The course ended with a zip wire that meant you sped right over the length of the lake. It was awesome. I had one wobbly moment but adrenaline urged me on, and the zip wire made it totally worth it! I left my brother as photographer and think he did pretty well! Although a harness and gym leggings is never going to be a hot look! Having decided to save money on food by cooking ourselves, we did agree we should visit The Pancake House once during our stay. It was amazing. I went for a full on fatty breakfast of pancakes with banana, toffee and chocolate sauces and cream. Totally the best decision I made that day. Sunday afternoon was spa time for us girls. The range of saunas and steam rooms was epic; they had different temperatures, different aromas, different essential oils, different lighting, different seating, different sounds. We all left feeling positively chilled and relaxed (and a little tipsy after prosecco and mojitos!). The weekend left us all absolutely exhausted. But I wouldn't have had it any other way. It was so wonderful to spend time with Dan and my family - and to share Oscar's first holiday! I would thoroughly recommend a stay at Center Parcs and would like to thank my parents for such a fun filled weekend!